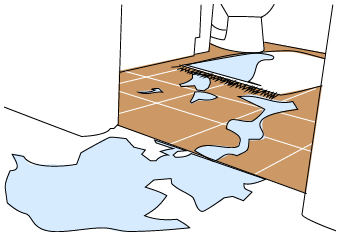 A flooded bathroom can do as much damage to carpets as it can to bathroom fixtures. Knowing how to deal with a flooded bathroom can not only save you money, it can defuse an otherwise very dangerous situation. Modern bathrooms are fitted with all kinds of electrical outlets and accessories which can become fatally hazardous when mixed with water. Flooding can also create long lasting consequences for the structure and stability of your home. Depending on the severity of the emergency, you may have to take rapid action to prevent or limit the amount of damage done. Sadly, flooding’s not an uncommon occurrence in bathrooms – especially older ones. It can be caused by many things, from burst fittings to an unattended bath or an overflowing sink. If it’s a flooded bath or sink the solution’s pretty obvious – just turn off the taps. If it’s caused by burst fittings or pipes though, you will need to turn off the water supply at the mains very quickly. Locate the main water supply to your home and turn it off immediately – it’s normally somewhere in your front yard towards a corner near the fence. Regardless of what’s leaking, this should help to stem the flow. You should also switch off the electricity at the main circuit board if water’s come anywhere near electrical outlets or appliances – do this first if there is any risk at all. If water has come into contact with electrical fixtures, call an electrician and don’t turn the power on until you’re advised that it’s safe to do so. If you’ve had a burst fitting, call a plumber to fix it. Provided that you’re sure there’s no danger of electrocution, the next step is to clean up. If your bathroom has sloping floors leading to a floor drain you shouldn’t have much damage anyway, but the first step in any case is to grab all the spare towels you can to soak up as much water as possible. Depending on how long the flooding went unnoticed, this may a big job. If the flooding has flowed into other rooms, start at the edge of the wet patch and work towards the bathroom. Use any portable heaters or fans you have to start drying out carpets as quickly as possible. The smell of a mouldy carpet will never quite go away, so make sure they’re very thoroughly dried out. This is also important to ensure that any wood in the floor underneath is not permanently damaged. Make sure that you have proper ventilation for this too; you don’t want all that water evaporating only to soak into your walls and ceilings. To head off the problem of flooding, most baths and sinks nowadays are equipped with overflow valves that drain off any water when it reaches an excess level. Sloping floors with drains will also stop most flooding, but in both cases, they are only effective if they are kept clear. Bear in mind that if flooding does occur, things such as wash cloths and loofahs will likely be sucked towards the drain and may block it, so try and keep these items out of reach of the water level.